Some of my seed starts are about finished and ready for transfer out to the real world. Some are actually completely finished, ie crispy, fried, dead, deceased, etc. I have been fighting fungus gnat/ whitefly / aphid infestation on my peppers all winter and not surprisingly, the little bastidges found some of the fresh young seedlings to be of a superior grazing quality. One evening, while briefly overcome by a wave of impatient insect hatred, I mixed up a water/dish soap mixture that was over the tolerance threshold for some young plants. The bugs suffered heavy casualties to be certain, but the (temporary) victory came at a cost. For the record, arugula, pak choi, and radishes are extremely sensitive to homemade potions of insecticidal soap sprays. (I feel better for getting this burden of baby plant killing guilt off of my chest). OK, back to the point of this post….. The radicchio is ready to move outside but the peppers it shares a tray with are still at least a month away. As I separated the radicchio cubes, I was reminded why I decided to try the soil cube route in the first place. 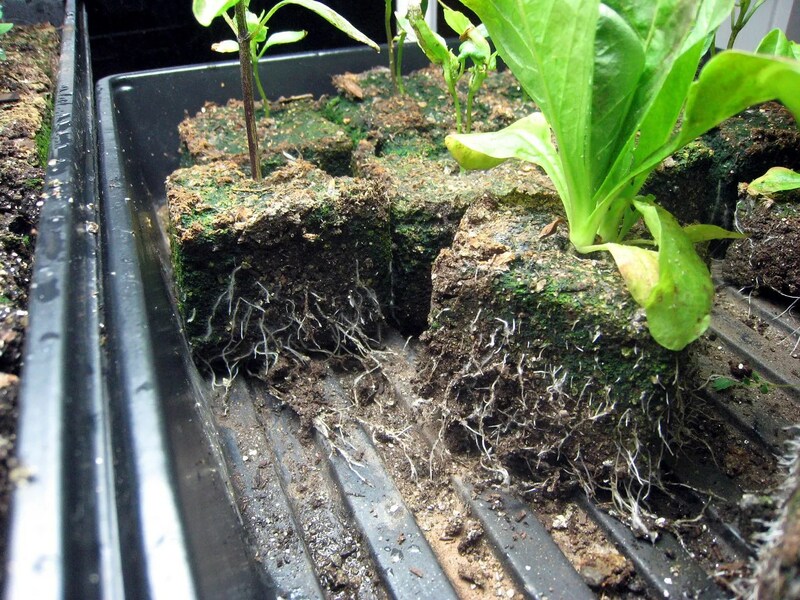 Traditional “walled” seedling pots (and to a lesser extent “peat” pots) provide a barrier for growing roots that deflects or redirects them to continue growing until they are spiraling around the pot. We’ve all seen the nursery plants that appear to be wrapped in a balls of fine white thread when popped out of the flimsy 4 or 6 pack. Supposedly, this condition at best creates a delay in the plant taking hold in the garden; at worst it creates a condition where the plant is stunted and less productive that it would have been otherwise. Since the soil cubes don’t have an outside edge to deflect roots, the roots don’t grow into long inter-wrapped spirals surrounding the plant. Instead, they reach the cube edge and emerge slightly; then at this point they just stop growing (usually). When they hit air, they naturally stop and hence the term “air pruning”. As one stops growing, energy is diverted into other roots until you have a profusion of healthy roots all “timed out” at the edge of the cube. 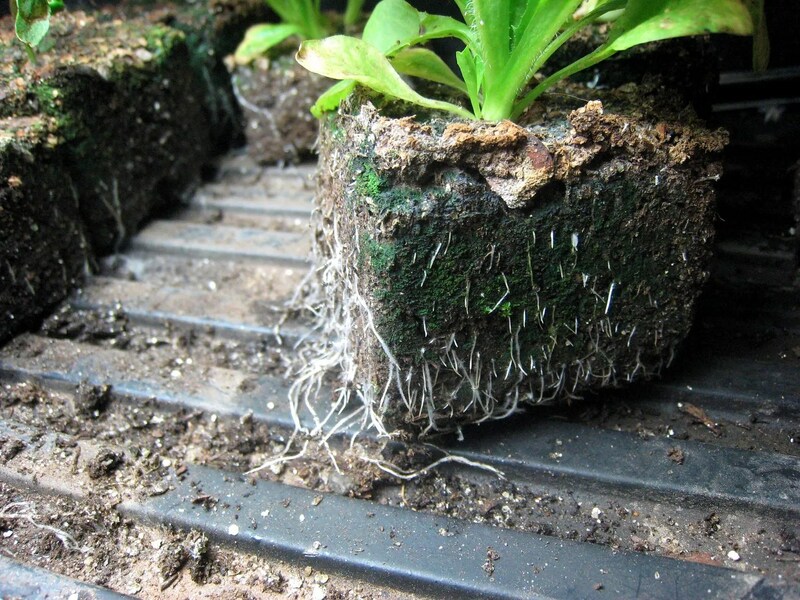 Once transplanted, these roots are well positioned to take off again and this should shorten the period where the plant is transitioning after transplanting. I believe the term for what cubes minimize or avoid completely is “transplant shock”. From another angle your can see that when the cubes are close together in the tray, roots sometimes don’t hit enough “air” to stop and continue to grow and get a little shaggy. The interesting thing is they only continue to grow down the space between the cubes and never invaded to neighboring cube. The pepper plant in the back sent roots out under the radicchio cube but not into it. Ideally the seedling cubes would be held in a humidity controlled environment where space can be kept between the cubes and the base would be some sort of grid to allow air to circulate underneath as well. I can’t provide those conditions so I opted to keep them snugged together in order to keep moisture more consistent. The resulting shaggy roots are a byproduct of this; it didn’t seem to matter with the lettuce I put out last fall. It may all be bunk; my own experience so far would suggest there is something to it though, so that’s my story and I’m sticking to it….